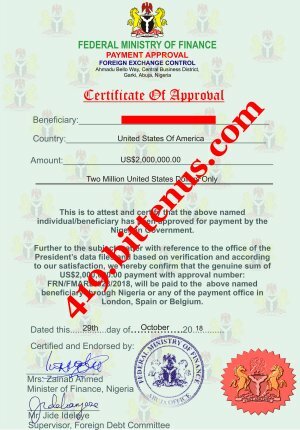 I hereby confirm to you that the approval documents have been issued and I am sending a copy to you for you to download and view. After you transfer the fee to the above account, you send me the bank transfer copy which will be used to confirm the transfer. 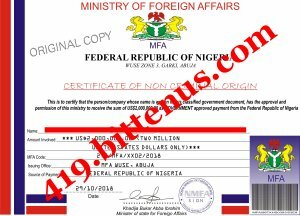 If you cannot go to the bank, you can look for agents that transfers money to Nigeria and then transfer the above fee of US$330 to me as soon as possible and after the payment is received from you, I will issue you the RECLAMATION CODE which the paying bank will request from you before they agree to transfer your overdue fund to your bank account. I will be waiting for your urgent response with serious action because 5th of November 2018 is the date when your overdue fund will be transferred to your bank account so that you can have peace of mind once and for all. I am committed to serve you better so as to make you happy and I sincerely apologize for the delay so far but be rest assured that with me on board, you shall smile in the next one week.